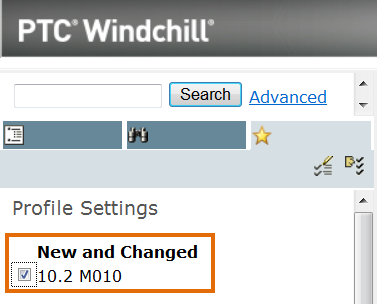 In PTC Windchill 10.2 M010, a new profile category, New and Changed, is available in the PTC Windchill Help Center. In the PTC Windchill Help Center, you can select a New and Changed profile to display only those topics that are new or significantly changed since the F000 release. Profiles are available on the Profile Settings configuration pane. For more information, see the "Profile Settings Configuration" topic in the PTC Windchill Help Center. Tip: Enter the topic name in the PTC Windchill Help Center search field to easily navigate to the topic.